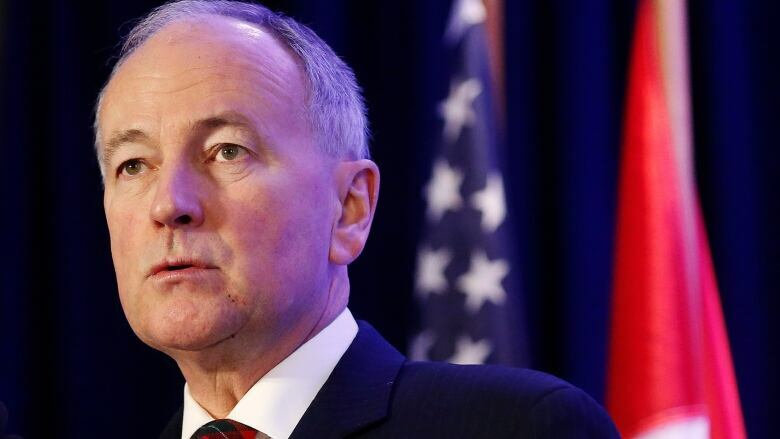 Defence Minister Rob Nicholson is calling on Russia to get out of Ukraine, saying that what's happening there is "completely unacceptable." Speaking at the International Security Forum in Halifax, Nicholson told delegates during a panel on Saturday that the people of Ukraine deserve the freedom they fought for. Nicholson said he believes Canada is doing all it can to oppose the conflict, but Russian President Vladimir Putin isn't getting the message. "It's certainly my hope and the hope of everyone that he does get the message," Nicholson said. "We are not going to let up on this ... Whether it takes five years or 50, the people of Ukraine deserve the freedom that they deserve, that they fought for. "That has to be one of our goals." The conflict in Ukraine, where pro-Russian rebels are fighting Kyiv's troops, has claimed more than 4,000 lives. A week ago, Prime Minister Stephen Harper made international headlines after telling Putin at the G20 summit in Australia to "get out of Ukraine" during a private leaders' retreat. Harper warned that if the world community eases up on Russia for its annexation of Crimea earlier this year, it will only whet Putin's appetite for similar aggression.